The “trial of century,” as it has been billed, began this week: Saddam and seven of his aides face charges for their alleged involvement in the 1982 killing of 143 Shiite civilians in the Iraqi village of Dujail. There will be other charges as more cases are brought against Hussein, but Dujail is considered the prosecution’s strongest case. BEIRUT — The Daily Star (Independent), Lebanon, Oct. 20: The trial of Saddam … marks the first time that an Arab leader is being held accountable in a court of law for his crimes against his country’s citizens. It is for this reason that so many across the Arab world are watching the trial of Saddam Hussein with special interest. … Interestingly, Saddam’s trial is occurring simultaneously with similar legal developments in Lebanon, where regime figures implicated in the assassination of former Prime Minister Rafik Hariri will also be held accountable for their crimes … In both Iraq and Lebanon, the many citizens whose lives and families were affected by murderous regimes are hoping that the regimes’ leaders will be dealt heavy punishments by the courts. But while retribution will be necessary in order for the wounds of the Iraqis and the Lebanese to heal and for citizens to feel a sense of closure, it is even more important that justice and the rule of law be upheld … As we map out a new future for ourselves in the region, we cannot afford to replace one brand of tyranny with another. If carried out properly, the trials of Saddam and former Lebanese and Syrian regime figures will mark a turning point in the history of the Arab world. DUBAI — Gulf News (Independent), United Arab Emirates, Oct. 20: People who watched the poor quality broadcast of the proceedings had mixed feelings and differing opinions. Some sympathized with Saddam for being questioned in a court where the country is under occupation, thereby questioning the credibility and the fairness of the court. Others were happy they were witnessing a very special moment: A man who was the symbol of oppression for many Iraqis being questioned about his wrongdoings. No matter what [the] individual views are, the unanimous opinion of the trial, which is adjourned until Nov. 28, is that it must be fair and transparent and should lay the foundation of a democratic Iraq. JIDDA — Arab News (Pro-government), Saudi Arabia, Oct. 20: Yesterday, while Saddam sat defiantly in a Baghdad courtroom, the results of … the referendum on the new constitution, were still being tabulated … The idea of a free vote, let alone a result which could be held up by vote-rigging checks, is clearly entirely alien to the ousted dictator … Saddam’s way of rule was very different … he deliberately created the brutal climate in which subordinates knew that they could massacre suspected opponents with his absolute approval. It is the same merciless climate of violence that now disfigures post-Saddam Iraq as Al-Qaeda terrorists work with die-hard Baathists to try and destroy the political pluralism that U.S. military intervention has brought about … At one point yesterday, Saddam asked angrily “What does this court want?” The question demonstrated his inability to understand that the calm and measured proceedings of the trial reflect the quest of all Iraqis to live their lives in peace and justice without fear and violence. AMMAN — The Jordan Times (Independent), Jordan, Oct. 20: The Shiite-Kurd government is making a grand show of the trial, prompting accusations that Saddam will be “lynched by his enemies.” Indeed, this government is made up of his opponents who returned to Iraq after the fall of the Baath regime … The Kurdish Democratic Party and the Patriotic Union of Kurdistan, the second largest bloc in the assembly, conducted a secessionist revolt against Baghdad for more than 80 years … Islamic Dawa and its offshoot, the Supreme Council for the Islamic Revolution in Iraq (SCIRI), carried out a protracted campaign of subversion against secular governments. The Iraqi state, as represented by the Baath government, had every reason to fight these anti-state elements in order to preserve the unity, integrity and national sovereignty of Iraq … Imprisonment without trial, torture and disappearance are never justified, but the defense team can be expected to argue, with reason, that Saddam was trying to counter [these elements] … The prosecutors would be on much stronger ground if, for instance, they were to prosecute Saddam for the murder of political opponents, including rival Baath party … By eliminating these men he was not seeking to defend the country but to maintain his grip on power and position. 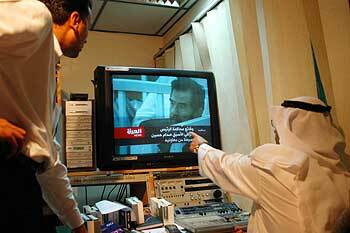 “Dujail Victims Await Saddam Trial,” James Menendez, BBC (International broadcaster), London, England. TEHRAN — Tehran Times (Conservative), Iran, Oct. 20: If Washington wanted to see Saddam tried for his truly monstrous crimes, then that would happen. But it probably won’t … The United States was closely allied to Saddam Hussein when he was committing the worst atrocities against the Iranians and the Kurds … It was U.S. intelligence photos … that provided the raw information about Iranian positions, and U.S. Air Force photo interpreters seconded to Baghdad who drew Saddam the detailed maps of Iranian trenches that let him drench them in poison gas. It was the Reagan administration that stopped Congress from condemning Saddam’s use of poison gas, and that encouraged American firms and Nato allies to sell him the appropriate chemical feedstocks plus a wide variety of other weapons. It was the U.S. State Department that tried to protect Saddam when he gassed his own Kurdish citizens … It was the U.S. that finally saved Saddam’s regime by providing escorts for tankers carrying oil from Arab Persian Gulf states while Iraqi planes were left free to attack tankers coming from Iranian ports. Even when one of Saddam’s planes mistakenly attacked an American destroyer in 1987, killing 37 crew-members, Washington forgave him. So the U.S. doesn’t want any of Saddam’s crimes that are connected with the Iran war to come up in his trial.